What makes the new normal for ordinary Venezuelans? Beside the most obvious things like waiting in line and spending time looking out for everyday products, here’s another part of our routine: visting the closest available ATM (or cajero). And then another one. And another one. Thanks to the combination of relentless inflation, the continuous printing overdrive of our Central Bank and BCV’s pigheaded refusal to issue a note worth more than 40 US cents or so (in the parallel market), folks have to make more frequent stops in the banks to withdraw money in order to keep up with prices. Economists even have a name for this: shoe leather costs. “I’m waiting for more than half hour to do something that shouldn’t take more than five minutes”, critized businesswoman Maria Castillo, while she waited her turn to withdraw cash. Going to the ATM to withdraw or for a balance inquiry now calls for preparation and patience. In the article, sources related to the banks excused themselves for the instructions they have to follow, which sacrifice their customers’ needs in order to comply with an ever-increasing burden of regulation. 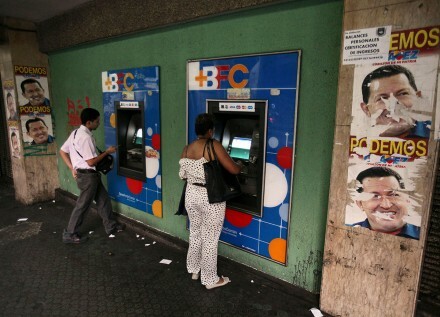 But apparently, there’s another reason for the problem: according to a report from the Central Bank, the number of ATMs in Venezuela stopped growing. Last year, only 42 new ATM machines were installed nationwide. In comparison, 635 new cajeros were incorporated in Venezuela back in 2012, and 478 in 2013. Cajeros are complex machines that either break down, are vandalized or become targets for criminals. And given that their spare parts come from abroad, which require dollars and you probably know where this story is going… Tranquilo, I won’t go into a subject that many others have already explained way better that me. At least banks took the “ecologic solution” to deal with the shortage of receipt paper: dropping receipts altogether.